Embrace the colors with our Featured Item Of The Week 'Autumn In Boston'. This stunning arrangement of rustic & green hydrangea, roses, calla lilies & hypericum berries is designed in a cylinder vase bound in brown satin ribbon & gold aluminum wire. 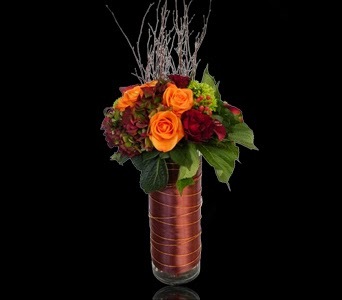 To order this arrangement online, please click here. To view all of our seasonal custom floral arrangements, click here.